International duo Rory Best and Jacob Stockdale are set to make their first appearances of the new Guinness PRO14 season with Ulster when they face Connacht in Belfast on Friday night. It is a timely return for the two Ireland Grand Slam heroes gives Ulster depleted numbers as the dreaded injury jinx strikes the Province again. Adding to Best and Stockdale return from injury is Sean Reidy, who along with scrumhalf John Cooney - who suffered a scalp injury last weekend - are in the mix for this weekend’s second Irish derby of the season. However, the good news from the Ulster medical team was tempered slightly with confirmation that Darren Cave is out for up to eight week having suffered a fractured thumb during the heavy loss to Munster last Saturday in Limerick. Iain Henderson suffered concussion in the same match and will follow the return to play protocols and it is likely he will not be involved this weekend. Also ruled out for an unspecified period is prop Wiehahn Herbst, who underwent surgery yesterday on a torn abductor tendon sustained in the recent game against the Cheetahs. The Ulster medical update added that Marcell Coetzee (shoulder), Will Addison (back) and Michael Lowry (shoulder) were “recovering well” from recent injuries and would continue to be assessed throughout the week. With the Euopean Champions Cup due to start next week, Ulster will not be risking anyone close to a return. Leicester Tigers are due to visit Kingspan Stadium on Saturday, October 13 with Ulster away to French side Racing 92 a week later. The current injury list also includes: Peter Browne (concussion); David Busby (knee); Rob Herring (toe); Louis Ludik (hamstring); Rob Lyttle (knee); Luke Marshall (knee); Kyle McCall (elbow); Marty Moore (calf); Jordi Murphy (ankle); Tommy O’Hagan (ankle); Jack Owens (concussion); Henry Speight (knee). Ireland and Ulster skipper Best and wing star Stockdale have missed the opening month of the new season because of hamstring injuries. Best’s injury ruled him out of his country’s Test series win over Australia in June. Having been hammered 64-7 against Munster with a depleted side, it again reflects Ulster lack of strength and depth when key figures are missing. 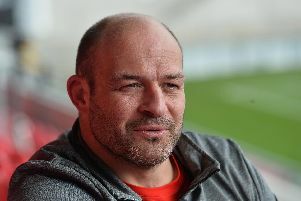 In respect of that Ulster head coach, Dan McFarland, said: “We did not put out the team, and I am talking about not just the players on the pitch as individuals, but also how we coached them and we performed as a unit (against Munster). Suggested a weakened team was sent, McFarland refuted that. “Have you seen our injury list? We were not doing that. He added: “I genuinely thought we would come down here and a good account of ourselves, and we did not. That’s the bottom line. It was a record loss for Ulster in Limerick and Connacht, Friday night’s visitors, will perhaps see this as a real opportunity to finally break the ‘hoodoo’ of not having won a match in Belfast since November 1960.